Development of novel and eco-sustainable tandem protocols for bioactive (anticancer and antimicrobial) molecules. Design, synthesis, computational validation of hetero (aromatic) molecules with drug like properties targeted towards cancer. In area of cancer, our group is focusing on finding potential lead molecules against tumor M2 Pyruvate Kinase (M2PK) enzyme having widespread occurrence in several cancer types. Targeting this enzyme with potent and selective agents will thwart the progression of cancer. Our group is also working on development of thiazole based small molecule BCL2 inhibitors. April, 2011-April 2014: Senior Research Fellowship, by Council of Scientific and Industrial Research, New Delhi. Young Achiever Award-2016, by SBSOSA, S.B.S. P.G.I, Dehradoon. Recent work published in European Journal of Organic Chemistry (2016) was highlighted in the form ofvideo by the journal. The work was considered highly significant. Central Drug Research Institute awarded CDRI-Research Incentive Award -2016. Best poster award- 2013 on at B.H.U Varanasi in conference organized by Chemical Research society (CRSI) of India. Award by the Institute of Himalayan Bioresource Technology, Palampur on national science day (28th of Feb) for publishing an article in Angew. Chem. Int. 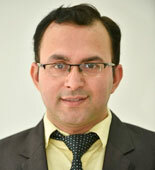 Edn (2013)..
Dr. P. D. Sethi annual award-2012 for best research paper (Angew. Chem. Int. Edn. 2012, 51, 2636-39) on Application of HPTLC in Pharma, Herbal and other Chemical Analysis. Award by the Institute of Himalayan Bioresource Technology, Palampur on National Science Day (28th of Feb) for publishing an article in Angew. Chem. Int. Edn (2012). Best poster award at CRSI North Zone meeting, at Jammu University (2011). Amit Shard, Kiran Rawat, Arun K. Sinha, Yogendra Padwad and Dinesh Kumar. Divergent synthesis of styryl–cinnamate hybrid analogues inspired by the natural product salvianolic acid F as a premise to investigate their anticancer activity and its metabolomic profiling. Eur. J. Org. Chem.5941-5949 (2016). DOI: 10.1002/ejoc.201601104. Amit Shard, Rajesh Kumar, Danish Iqubal and Arun K Sinha. Pot-economy synthesis of hydroxylated arylethenyl-arylethynyl-arenes through sequencial decarboxylative Perkin-Sonogashira reactions. Asian Journal of Organic Chemistry, 7:189-196 (2018), DOI: 10.1002/ajoc.201700504. Rini Jarial, Sveta Thakur, Mimi Sakinah, A.W. Zularisam, Amit Shard, S.S. Kanwar, Lakhveer Singh. Potent anticancer, antioxidant and antibacterial activities of isolated flavonoids from Asplenium nidus.. Journal of King Saud University–Science(2016), http://dx.doi.org/10.1016/j.jksus.2016.11.006 . Rini Jarial, Amit Shard, Sveta Thakur, Mimi Sakinah, A.W. Zularisam, Shahabaldin Rezania, S.S. Kanwar and Lakhveer Singh. Characterization of flavonoids from fern Cheilanthes tenuifolia and evaluation of antioxidant, antimicrobial and anticancer activities. Journal of King Saud University – Science (2017), http://dx.doi.org/10.1016/j.jksus.2017.04.007. Amit Shard, Kiran Rawat, Arun K. Sinha, Yogendra Padwad and Dinesh Kumar. Natural product Salvianolic acid F-inspired divergent synthesis of styryl-cinnamate hybrid analogues as a premise to investigate anticancer activity and its metabolomic profiling. (2016) Eur. J. Org. Chem. 10.1002/ejoc.201601104.